This review is for the second volume of the Zaregoto Series by Nisio Isin (with art by Take). The English edition was released by Del Rey in December 2010. There has since been no word regarding the remaining seven books. Following the events of the previous volume, our protagonist, “Ii-chan”, returns to the bustling life of a student in Kyoto. Though lively, the city is now host to a serial killer named “The Kyoto prowler”, a skilful knife-user who chops his victims in pieces. This isn’t the least of his worries since just after partaking in a birthday party, he finds itself in the middle of a murder involving Emoto Tomoe, whom he just befriended. Directly suspected, alongside his new found friends from college, Ii-chan will stumble on an affable murderer, two cunning police officers and the ever-blazing contractor. Ensues a classic detective story, intertwined with lengthy philosophical monologues about death, killing and forgiveness, subjects our nonsense babbler is very knowledgeable about. This ties with Nisio Isin’s “stream of consciousness” writing style. And again, the translator, Greg Moore, did a fine job transcribing Ii’s mind and thought process. The read is enjoyable, yet a little disturbed by Nisio Isin’s quirks. The wordy prose can be tiring at times, especially at the end of dense paragraphs who almost feel tacked to the story. The murder is a simple one, the methods employed get as convoluted as possible, with little to no clear suspect until the big reveal. And like before, when everything ends, new details are unveiled and change our vision of the whole mystery. The latter being complemented by slice-of-life moments showcasing the relations between Ii and the whole cast. An important point as, by now, it becomes evident that each Zaregoto book delves into bits of the human nature and relations. 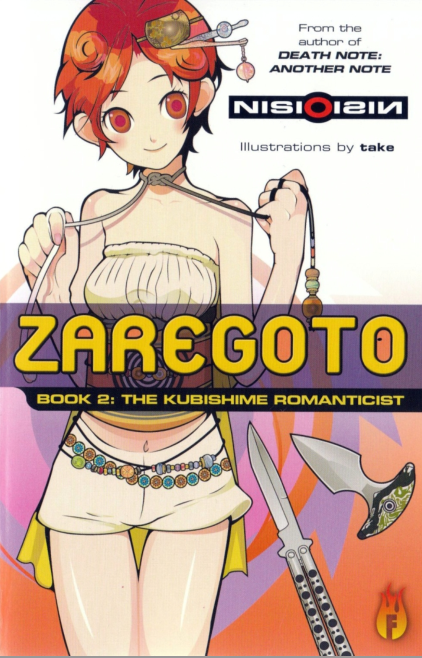 At the end, Zaregoto: The Kubishime Romanticist is a convoluted detective mystery, à la Agatha Christie but with a more interesting moral than a simple “bad guys killing for a simple reason”, as no one is a clear stereotype of the brainy detective with unyielding common sense. The method follows the one set in the previous instalment and while it doesn’t become stale for the moment, I think a renewal of the story development is welcome. Then again, I love my pun-filled mystery monologues. I’ll have another serving of Zaregoto, please. is there a hope for the vol 3 or the other one?? especially there will be anime for this…. Maybe if the anime has a huge following in the US and the English anime community, there’ll be talks of continuing the translation. But since Kodansha seems to be focusing on Monogatari for the moment, I wouldn’t get my hopes up. I really appreciate Greg Moore’s work on the series too. He managed to encapsulate Nisio Isin’s writing style into a tight, yet wordy prose.